Aldi is set to stock Medion's latest all-powerful PC, packing in a whopping one terabyte hard drive for only a penny under £600 this month. 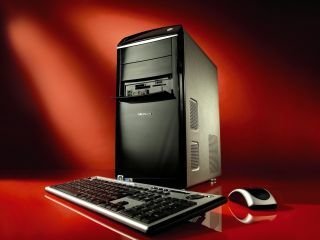 The PC ships with a three-year warranty and, as well as packing in some serious power and hard drive capacity under the hood, also looks pretty smart with it. "Music lovers can take advantage of its 1000 GB S-ATA hard drive which offers space for over 200,000 tracks," reads Aldi's press release, "and if you fancy getting snap happy there is plenty of space for all your pictures." Medion's latest runs Windows Vista Home Premium 32 Bit – though of course if you are like us you'll immediately upgrade to Windows 7 the second you get it home! Aldi's claiming the PC is designed for families, students, movie-buffs (with a Blu-ray drive included) and even gamers - packing in and NVIDIA GeForce GT 230 DirectX 10 graphics card "for fantastic visual clarity with games and multimedia applications."